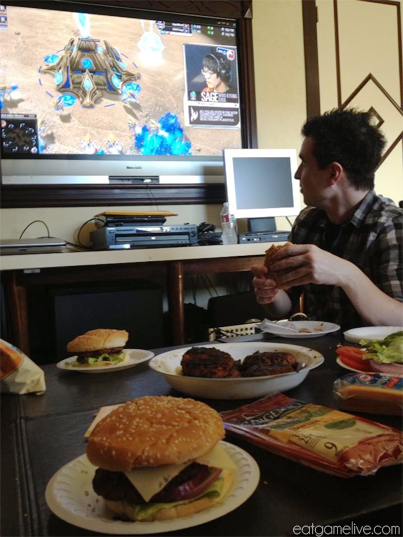 I will admit that I have been playing a lot less StarCraft than I would like. I wouldn’t say that I’m entirely out of the loop because I do watch streams and various tournaments. One of my friends was kind enough to host an MLG Anaheim viewing party — it’s like your own private Barcraft! I volunteered to cook and I decided to make these burgers. There may have been significantly more Jack Daniel’s than usual though. Oh well! Tournament play showcases some of the latest and greatest builds from the top players. However, I really only pay attention to the Terran builds. GLORIOUS HELLBAT MASTER RACE. Like many Terrans, I love the sweet smell of hellion-roasted drones on a fine afternoon. But, after seeing the offerings Blizzard has at this years San Diego Comic-con, I may have to reconsider my stance on Zerg abuse. I’m not a big convention-goer, so I’ve never been to or had the desire to go to Comic-Con. I honestly don’t think I could handle the insanity that is Comic-Con. But for those awesome folk who are in San Diego right now, I salute you and your tenacity! Speaking of awesome folk, a few of my friends from Geek Panda Apparel have offered to rescue me a cute little plush zergling of my own! Amazing, right?! 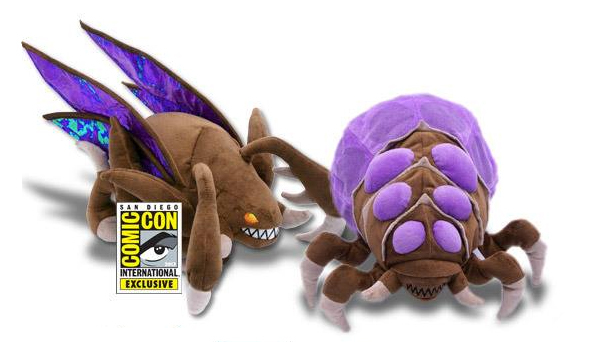 The zergling plush pretty darn adorable. Look at that smile! So maybe I’m developing a soft spot for the zerg, which is why this recipe is goes out to the Swarm. Total prep time is about 45 minutes. Total cook time is about 45 minutes. This will make 4 servings. Pre-heat your oven to 375° F (~191 C°). Add salt, pepper, 1/3 of your green onions, and 1/4 of your chopped garlic to your ground pork. Form the ground pork mixture into meatballs, roughly 2 inches in diameter. 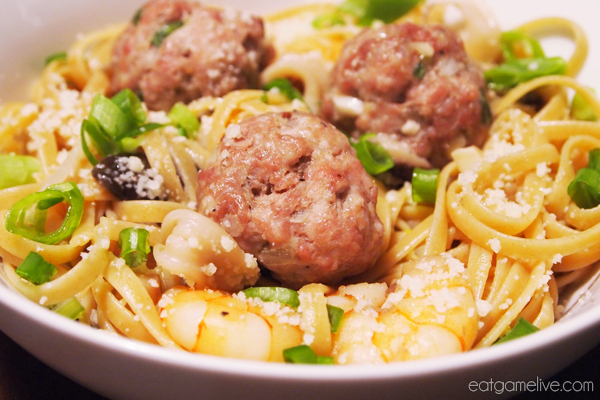 While your meatballs are cooking, prepare the rest of the ingredients. Boil your spaghetti in salted water. Reserve 1 cup of salted pasta water and then strain the pasta when cooked. 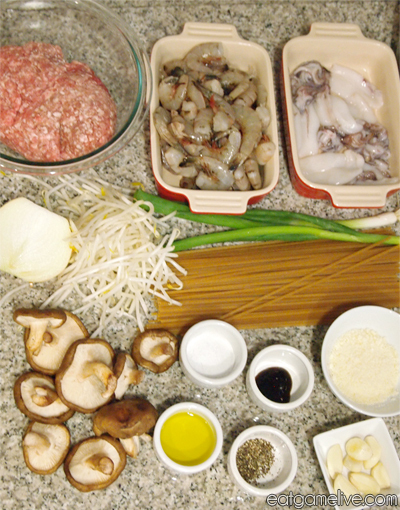 Combine oyster sauce and the pasta water to create a sauce. Reserve for later. Pour 1 tablespoon of olive oil into a large wok (or skillet). When oil becomes hot, add in your sliced mushrooms and garlic. Saute your mushrooms and garlic. Add your shrimp and squid. Saute until cooked (roughly ~5 – 7 minutes). Add in your meatballs (and any fat drippings from the baking dish) and mung bean sprouts into the wok. Stir to combine. Add in your pasta. Drizzle the olive oil and oyster sauce mixture over the entire dish. Thoroughly toss the pasta to combine. 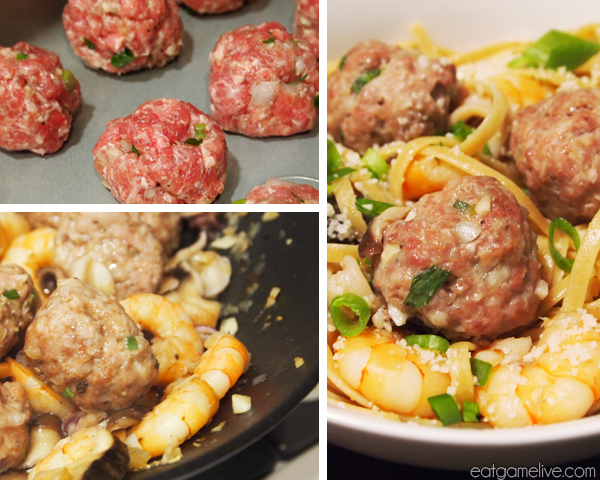 Remove from heat and serve with parmesan cheese and green onions. 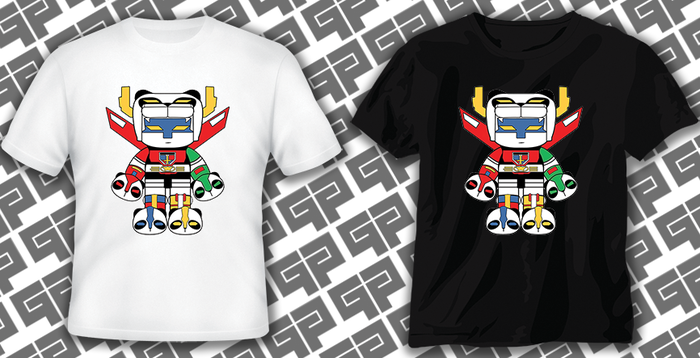 As I mentioned earlier, the guys at Geek Panda Apparel are down in San Diego for Comic-Con. Geek Panda Apparel is a group of my friends/former co-workers who’ve decided to wear their nerdiness with pride by developing a line of geek-culture inspired shirts. This entry was posted in starcraft, Uncategorized by admin. Bookmark the permalink. go back the prefer?.I’m attempting to find things to improve my site!I suppose its ok to make use of a few of your concepts!! All you need for performance and speed!